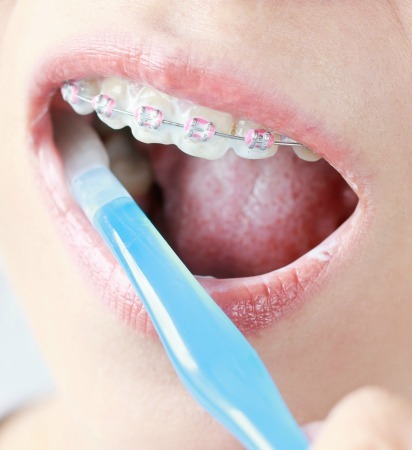 Brushing the brackets and wires can cause your toothbrush to wear more quickly than before braces. If you notice the bristles starting to bend or fray, replace your toothbrush with a new one. Do not swallow any toothpaste as you brush, and rinse your mouth thoroughly with water after you finish brushing. It is important to carefully floss and brush daily for optimal oral hygiene. Dental floss is a thin thread of waxed nylon that is used to reach below the gum line and clean between teeth. It is very important to floss between your teeth every day. A floss threader which has a stiff end will help you push the floss under your archwire. Floss at night to make sure your teeth are squeaky clean before you go to bed. When you first begin flossing, your gums may bleed a little. If the bleeding does not go away after the first few times, let a staff member know at your next appointment. For the most part, you’ll be able to eat many of the same foods you’ve eaten before. The general rule is to avoid things that are hard, sticky, gummy or chewy, to prevent breaking the bond that holds the brackets on the teeth.